Smell of Armageddon on Capitol Hill ? Ok what is happening in the not so great US of A ? Markets were clearly coming to a lull and Capitol hill has decided to spoil the party by throwing us a curve ball with this on-going wrangling over the budget and debt extension ceiling. Can you imagine the US going into default ? No one has any real idea of the full impact of such an event and because of this we see the Roubini of this world crawling out of the woodworks. Even Buffet mention the event has being potentially “Nuclear”. Clearly the US has already partially defaulted in 1979 on some of its treasury bills, this moved the yields by about 60bps in one day which by European standards does not seem much. Anyhow Forbes has published a good column on this…So this time is it different ? 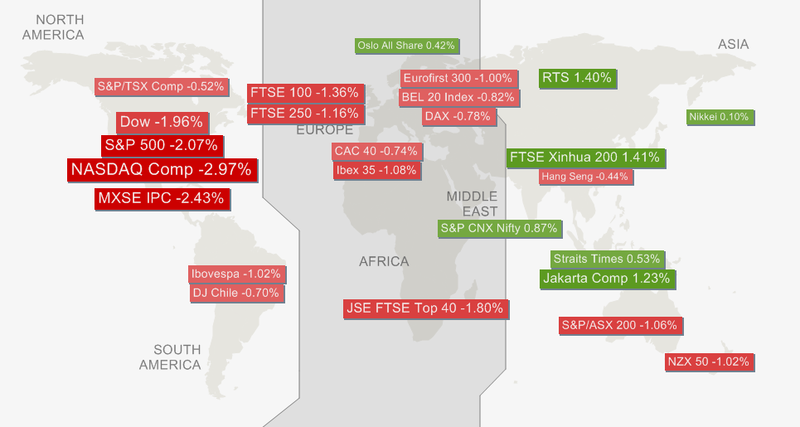 Well from what we can observe in the equity markets the reaction has been somehow muted. We have seen some retracement over the last five days but it still leaves us with a very healthy performance since the beginning of the year (assuming you invested globally in equities). Bearing in mind the nearing of the 17th of October which is when the US could potentially find themselves in default if the extension of the debt ceiling is not agreed upon I thought I would look at my risk indicators. 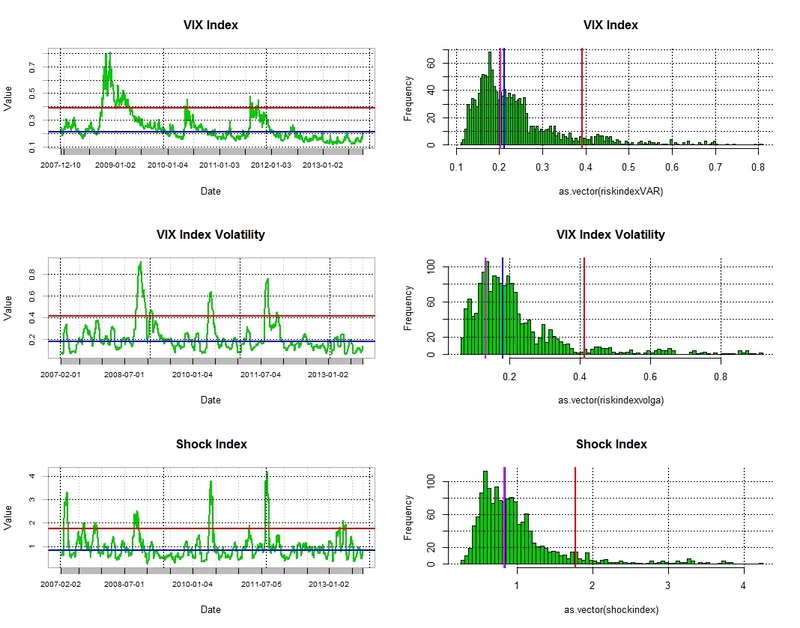 The left hand chart shows that the VIX is still trading near its long term median, that the volatility of the VIX (Volga) is also close its median and that the ratio of the Volga and the VIX which is a good indicator of financial system shocks has remained close to its median also. In other words by these metrics we are still in a happy, long risk world. 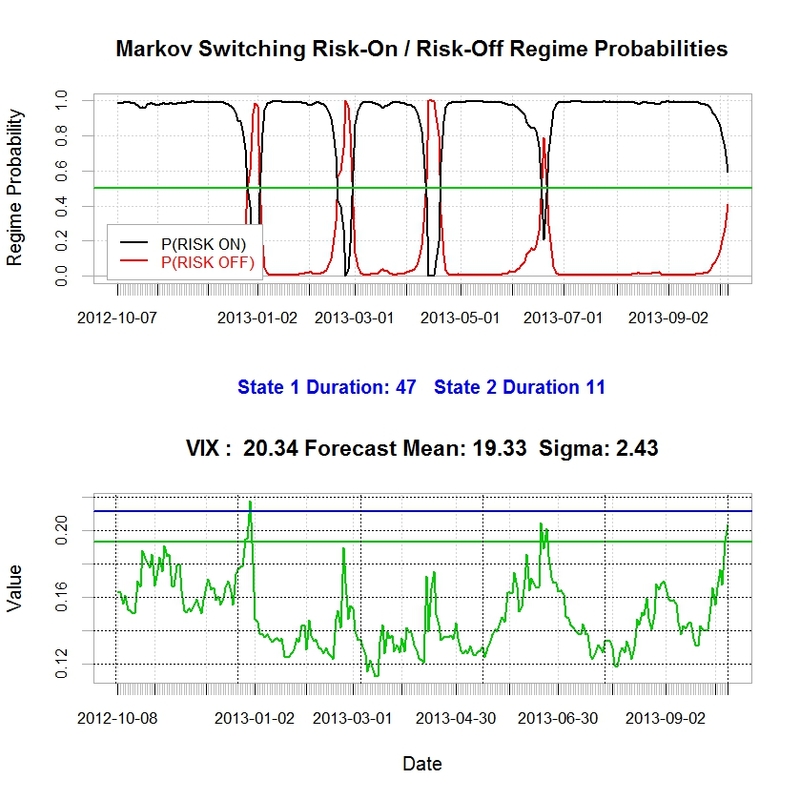 However the chart on the right hand side shows the probabilities of being in a high risk or a low risk environment derived from a 2-state Markov regime switching model applied to the VIX. In simple terms the Markov model aims to split the sample under review into two distributions (low risk, high risk) and to establish the probability of moving from of distribution to another. Clearly it seems that something has changed (in fact it started to change on the 29th of September). The model does seem to indicate that a bit of caution may be a good idea……Let ‘s hope those guys on Capitol Hill get to some convincing agreement …..I ll keep my tin hat at close range, just in case…. Posted in Uncategorized on October 9, 2013 by Pierre.